Choosing a homeschool writing curriculum can be a daunting task for any home educator, whether you are brand new or a seasoned one. Today here at The Curriculum Choice we’re sharing our favorite tried and true homeschool writing programs that span many ages. There are plenty of choices available to home educators when it comes to homeschool writing curriculum. How do you know where to start? What program or system will work for my children? I have asked myself these questions too many times to count over the past 17 years that I’ve been teaching my kids at home. But there is hope for you all, because we have a nice line-up of ideas for you here all in one place! Creative Writing Made Easy – The Zany Zoo Adventures writing guide is packed with information about how to create a whole Zoo City, it has been quite an adventure so far. There are twelve easy lessons with a handout or worksheet to accompany each lesson. The lessons build upon each other for a great final result. Creativity is stressed over the drudgery of grammar, and giving praise all throughout the writing process will propel your student into the writing pool with enthusiasm, and not to mention fun! Adventures in Story Writing with WriteShop Junior – The writing process can be very intimidating to young writers, especially boys who might also be reluctant readers to boot. The WriteShop Writing Curriculum is an incredibly detailed and very comprehensive writing curriculum set up for you as the Parent/Teacher to open and go with the program. Writing & Rhetoric Book 1: Fables – First, let me begin by saying, both Gabriel and I have fallen in love with this program from the get-go. If you are at all familiar with any of the products from Classical Academic Press, then you already know that they err on the side of excellence and seek to provide extremely high quality materials for home educators and educators alike from which to teach. Writing & Rhetoric Book 7: Encomium & Vituperation – This is the seventh book in the Writing and Rhetoric series and the first time for us using this program, so I chose to start my new freshman with this level for a bit of review and to introduce him to this style of using rhetoric within the writing process. We are using this program in addition to our regular weekly written narrations, and other writing that I have my freshman do for some of his different subjects. We are finding it to be a a nice balance in our school week. 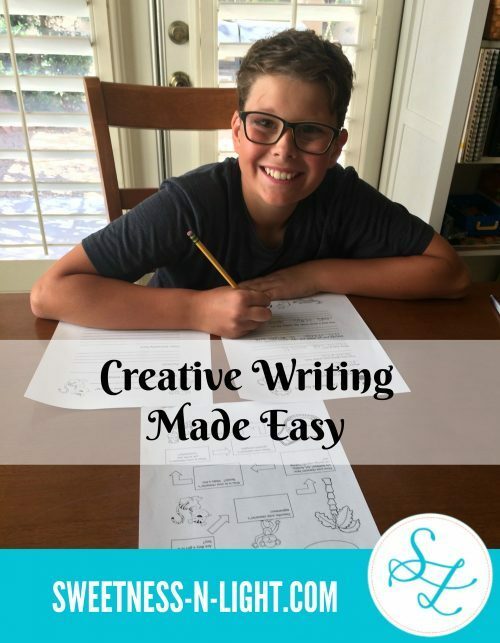 Why We Love Writing with Ease – The program was created and published in 2008 by Peace Hill Press as part of the growing resources available to parents who enjoy following the teaching ideas set forth in The Well-Trained Mind, also by Susan Wise Bauer. We like to infuse many different aspects of the Classical teaching model into our learning and this series has allowed my elementary and middle school children to gain confidence and necessary skills towards becoming proficient writers, a little at a time. How to Approach Language Arts in High School – This post is not specifically about writing, but good information in how to tackle all aspects of Language Arts including writing and composition in the high school years. As devoted followers of the Charlotte Mason method, we are firm believers that all aspects of Language Arts can be covered in a very thorough manner through Reading, Narrating and Writing. At The Curriculum Choice we have shared tips for homeschool writing curriculum. Be sure to browse the tabs above to find related reviews. You might also enjoy these that we’ve selected from our archives. The Curriculum Choice authors have active blogs where they regularly offer ideas and experiences about their homeschool adventures. Below are some of their experiences with homeschool writing curriculum. We have been homeschooling since my kiddos were toddlers. We have thereby used a wide range of curriculum materials both available for purchase and materials I have put together myself using free resources I have found online and at the local library. My children are now in their final years of compulsory education. My daughter is sophomore in high school and taking the majority of her courses at the community college via dual enrollment. 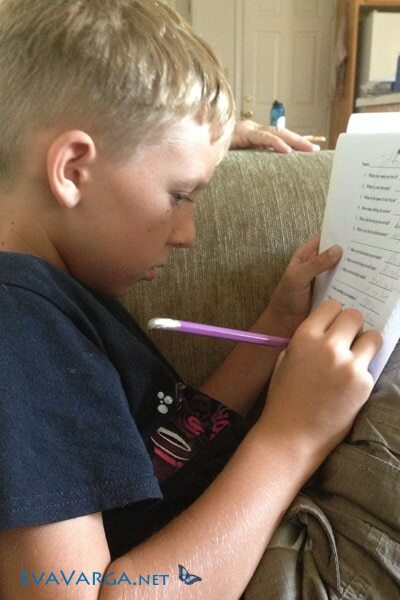 My son is entering 8th grade and is yet homeschooling under my tutelage. Cover Story Opens Doors and Builds Bridges – Creating their own magazine has been one of the most revered long-term projects in which my kids have taken part. The variety of writing assignments in Cover Story combined with a compelling yet challenging goal of publishing their own magazine have opened doors for future opportunities and built bridges between generations. Middle School Etymology with King Alfred’s English – History has always been one of my children’s favorite subjects. With King Alfred’s English, my daughter discovered a passion for etymology or the origin of words. Rediscovering the Lost Art of Parsing: Learn with Diagrams – When the kids were younger, we had done a little diagramming with Writing With Ease and Writing with Skill. However, the programs I had selected for junior high and high school lacked this component. When I discovered Learn with Diagrams, I knew immediately it was just the product I was looking for … challenging, comprehensive, and most of all, fun! Exploring Fan Fiction with Wattpad – Wattpad is a social media website that is geared to young writers. While I encourage parents to be cautious with this platform, it is worth exploring how this platform can inspire your child to explore writing for an audience. Use copy work and dictation. Although this sounds both simple and simplistic, it is undeniably the best foundation for good writing. The reading fills students’ minds with examples of good writing, the narration teaches them to organize their thoughts, an essential element of writing, and the copy work teaches them the basic mechanics, from spelling to punctuation. Besides these basics, it is helpful to use some formal programs. The highlight of our early years has been Emma Serl’s lovely little curriculum Primary Language Lessons and Intermediate Language Lessons. Our older children have studied grammar (Rod and Staff grammar), fiction writing (NaNoWriMo), imitating various styles (The Writer’s Workshop review and how we used it), AP English (with Alexandra McGee), and the history of the English language (King Alfred’s English). Of course, they have also used other resources, but these are among the best and I highly recommend each one of them. With our classical base of Tapestry of Grace, we get weekly practice with writing – of all styles – that matches the topics of our studies. I love how it all weaves together. 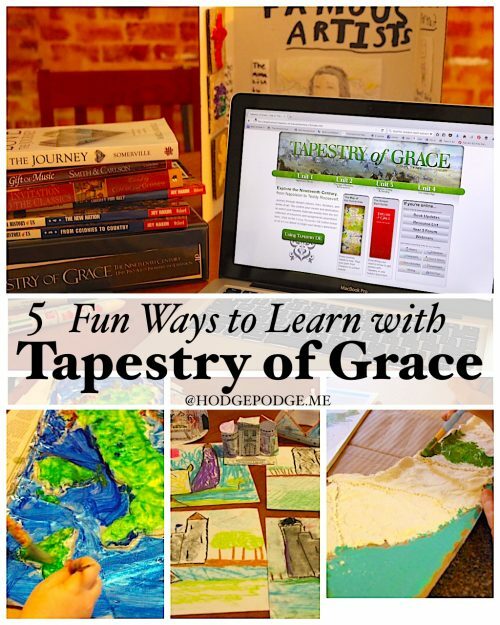 Fun Writing with Tapestry of Grace – Yes, I said fun writing. Because the weekly writing assignments (and rest assured, we don’t get to them every week) are different. They are challenging. They are fun. The topics match what we are studying and the grade/age level. All rolled in with what we are studying so it is not such drudgery. Writing Workshop for Multiple Ages – Sometimes in our homeschool we just need to focus on a certain subject. I’ve mentioned this strategy in When You Need to Catch Up. This week it was writing. 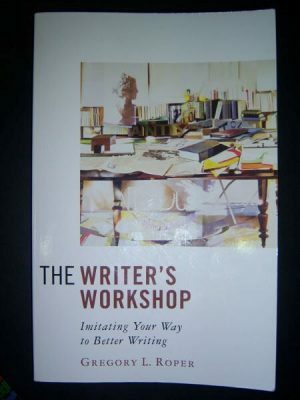 So, rather than say, “Children, write!” I decided we would call this week a Writing Workshop. Something about a workshop makes it a little more fun, don’t you think? A workshop implies all sorts of things and reminds me to pull out all the resources. Writer’s in Residence – Teaching writing in homeschool can definitely be overwhelming. However, Apologia’s Debra Bell has a brand new curriculum, Writers in Residence, to help with just that. This fantastic resource is not only a homeschool writing resource but a writing focused language arts curriculum. 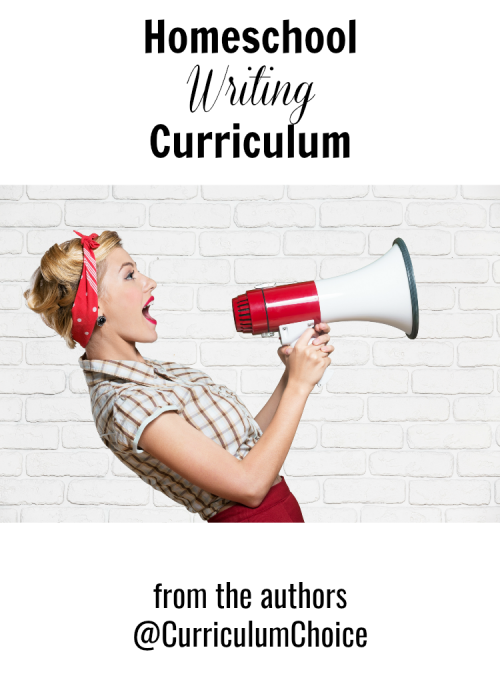 No more overwhelm! Our homeschool writing Pinterest board.